Since 1994, AMPHOS 21 has offered its services in the areas of scientific, technical, and strategic environmental consulting. Our headquarters are in Spain, with additional offices located in Chile, Peru, and France. AMPHOS 21 provides access to a variety of specialists with high levels of technical proficiencies to meet the needs of a dynamic and increasingly specialized market. 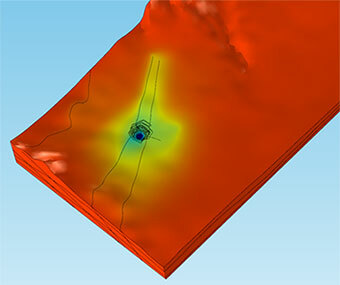 In addition to our advanced computational modeling abilities, we are proficient in running studies of site characterizations, executing and monitoring hydrogeological exploration, and performing laboratory studies. Our consulting group services the market through a tight synergy between our expert scientists and our experienced modelers. The scientists have extensive knowledge in areas such as chemistry, geochemistry, hydrogeology, and physics, while the modelers hold strong backgrounds within mathematics, physics, and computer science. 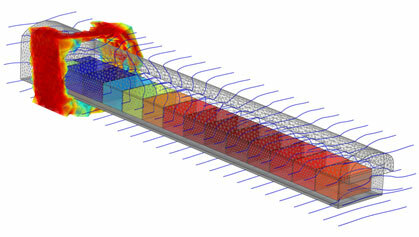 Below are examples of our COMSOL Multiphysics simulation projects. This image depicts the water head in the waste compartments, flow streamlines, and hydraulic conductivity of the fractured rock surrounding the repository (isosurface plot). This model shows the unit fraction of sodium occupancy in the cation exchanger of the bentonite column after six months of hydration and heating. This image shows the water head distribution in a 3D hydrogeological model involving several geology strata, two rivers, and water recharge conditions. This illustrates the steady-state groundwater pressure head as well as the hydrogeological impact produced by mine dewatering. AMPHOS 21 CONSULTING PERU, S.A.C.